For their 5th anniversary, they have revamped the packaging of some of their best-selling products, including a highlighter, eye liner, cream blush, nail polishes and lipsticks. 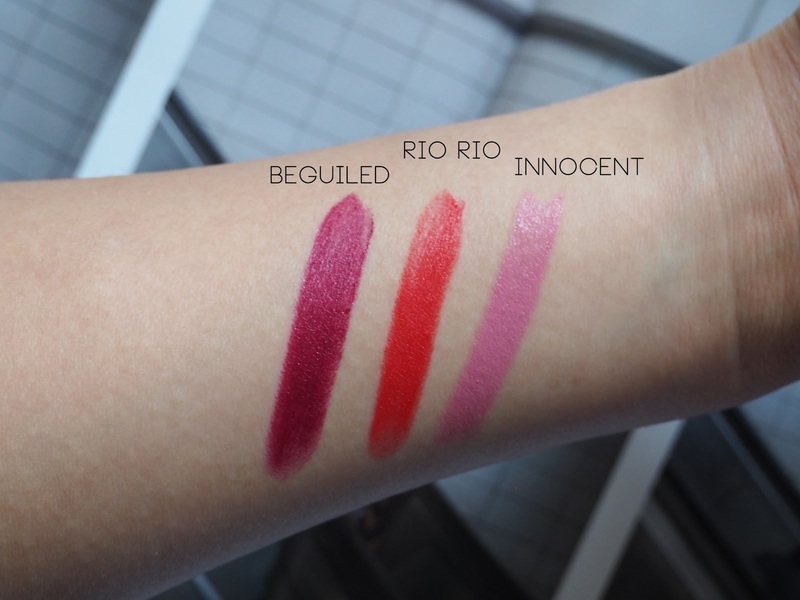 Though we all know the struggle of having to choose colours based on online swatches, I managed in the end and settled with the shades Beguiled (2014), Rio Rio (2012) and Innocent (2010). 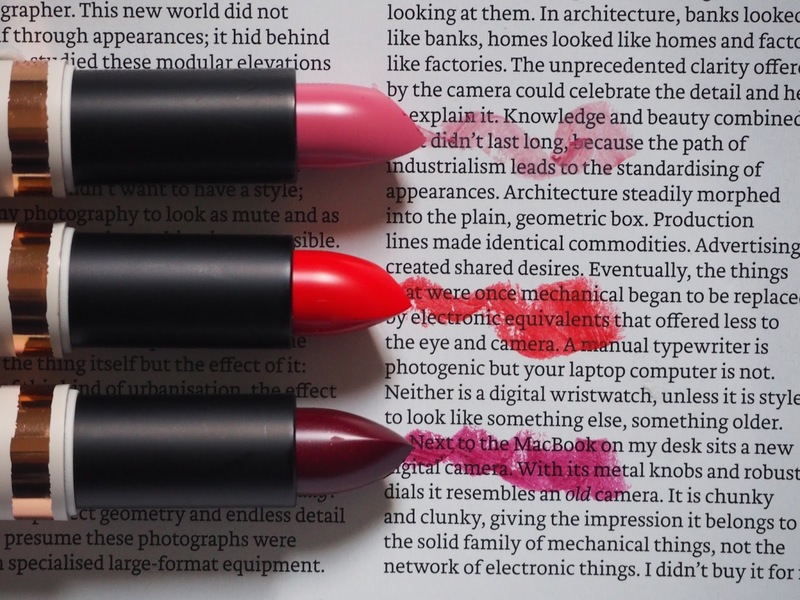 Beguiled is a gorgeous burgundy, wine red that makes every look go from day-to-freakin’ sassy. I love the colour and it’s really comfy to wear on the lips. That being said, application-wise it required a lot of effort and it looked rather patchy. I’m not writing it off just yet, but this is definitely reserved for those days when I’ve got a lot of time to slowly layer it. Rio Rio on the other hand is just a bliss. It’s so comfortable to wear on the lips, a hybrid between matte and glossy, and it’s just the perfect bright red. The colour really reminds me of Hourglass’s Opaque Rouge Liquid Lipstick in Raven, though it’s nothing alike in terms of colour. Although I love my reds and berries, when the sun makes an appearance, I quite fancy my pinks as well. Innocent seemed like the perfect cool-toned pink. I still think it’s very pretty, but it’s just not for me. I can’t really put my finger on it, but it makes me look like I’m channeling my inner-Nicki Minaj, and I’m not really sure that’s my look. It’s not as opaque as the other two, but is really nourishing and the colour is really easy to build up. I find that all three last about 4-5 hours on me before I have to re-apply, after having brunch, lunch, afternoon tea and snacks throughout the day. You’ll definitely need to re-apply when you’re having loads of warm foods and drinks, but I can live with that. Rio Rio has definitely become a staple in my reds collection, and I can’t believe how long it’s taken me to try it. 5 freakin’ years to be exact.